I’ve been really busy these few weeks and missed out last week’s update. I mentioned previously that I am reaching the end of this blog’s life as I will be moving to Japan for work. The really worrying thing right now which I never really announced is that I will be flying off at the end of this month, and all my models are still in the lurch. My company wasn’t really committed to finalising the details so I was really hoping for some kind of delay but everything went according to schedule. 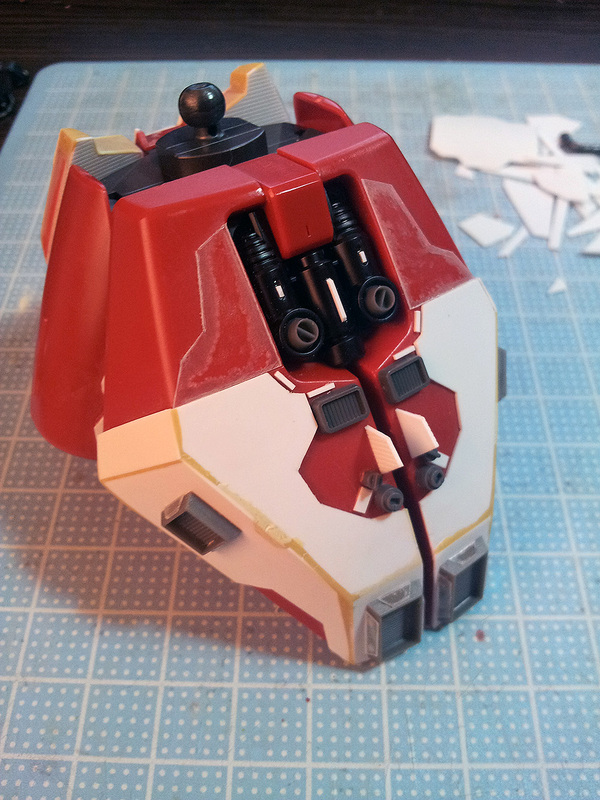 My progress on the Sazabi has been slow all this while even though I seem to be spending quite a bit of time on it. On the other hand I’m getting less free time by the day. I used to have to only work for half a day (just studying Japanese) but I’m reluctantly bidding farewell to my free half days off now. I started working on the legs a few weeks ago but my motivation was totally killed when I realised I still had to do lots of epoxy work so I turned to the Joker. Unfortunately with so little time left I might not be able to finish painting it before I fly. For the legs of this guy I added some pla-plate to the shins but the shape of the lower legs meant that it was impossible to just bend more sheet styrene and glue them on ie. it’s epoxy or nothing. I initially thought the last of my epoxy could be used on the thighs but I had to go buy a new pack. I’m still in disbelief that I used up a whole pack of epoxy in such a short time. Of course, there was lots of sanding and multiple rounds of adding on more epoxy to finally get the shape I wanted. With exactly one week left before I was to fly off I decided to finally stop messing with this guy as I did not want to leave it unfinished for the next two years or so while I’m overseas. This is a pic I took at 3am on Saturday night. 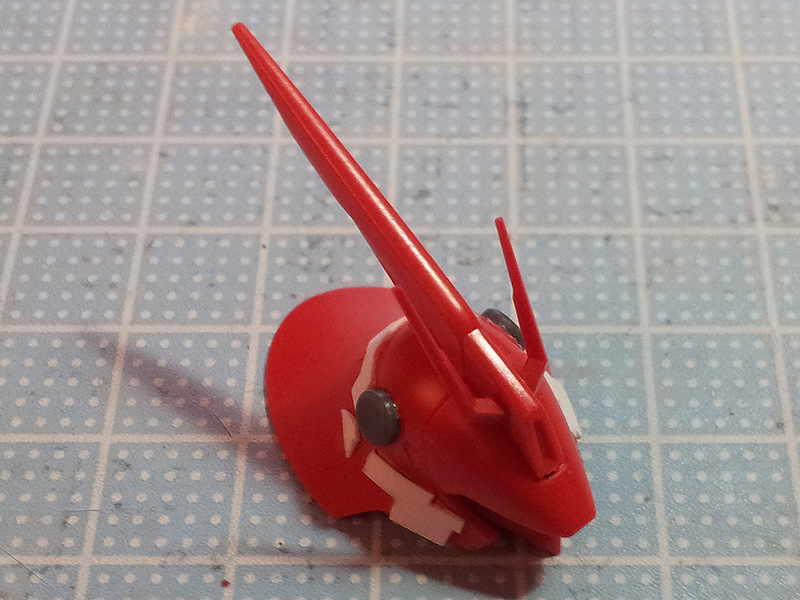 There isn’t much in terms of surface details so it still looks like a run-of-the-mill HG kit. Now I will have to rush through the painting and all the remaining steps. And I still haven’t started packing my stuff for the move. I am so not prepared right now. Oh dear. I initially decided to do an OOB build for the Joker considering how deep a hole I dug myself into when working on the Sazabi but its flaws were just too glaring for me to ignore. When I got tired of messing with the Saz I decided to mutilate this guy and see if I could make it a little bit better. Here’s a picture of the offending hip joint which I talked about previously. Like the other Strider Frame models the position of the hip ball severely restricts the articulation range of the legs. On my Joker the thigh cups are also incredibly loose so the legs fall off without effort. 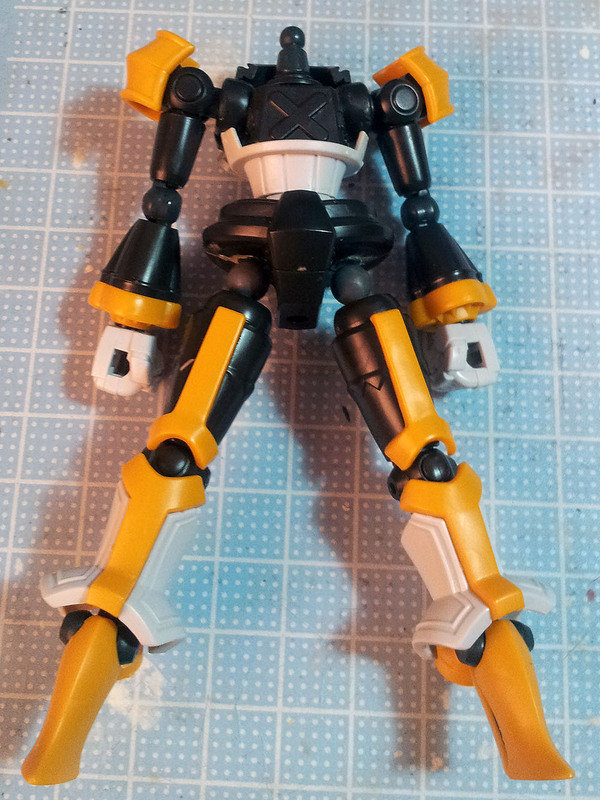 The knee is also unable to straighten completely so neutral standing poses look a bit weird. 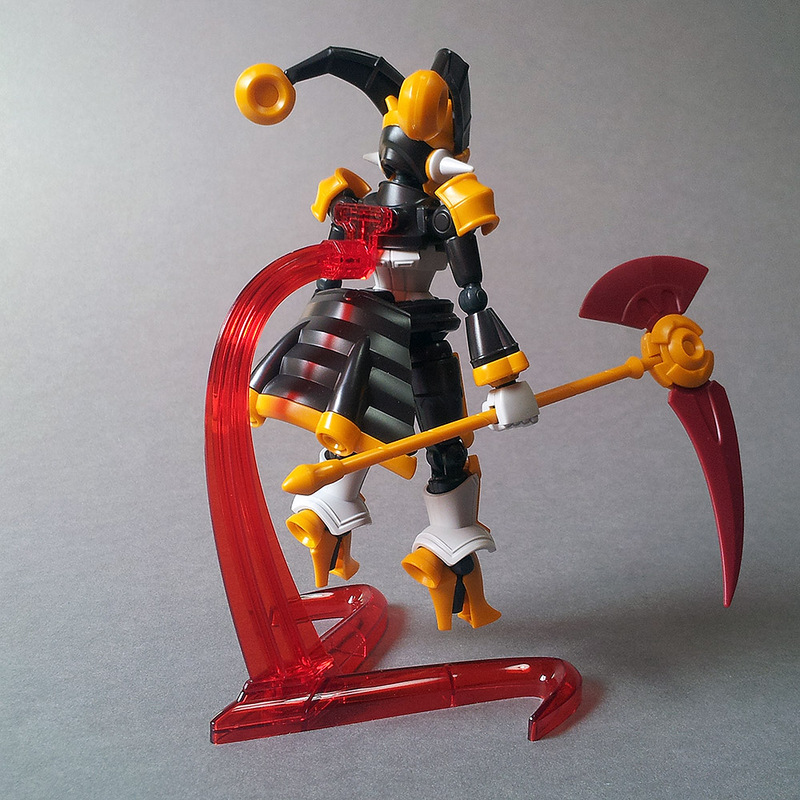 I removed the existing hip joint polycap and replaced it using the leftover polycaps from the Elysion and a pair of aftermarket ball-shaped double joints. 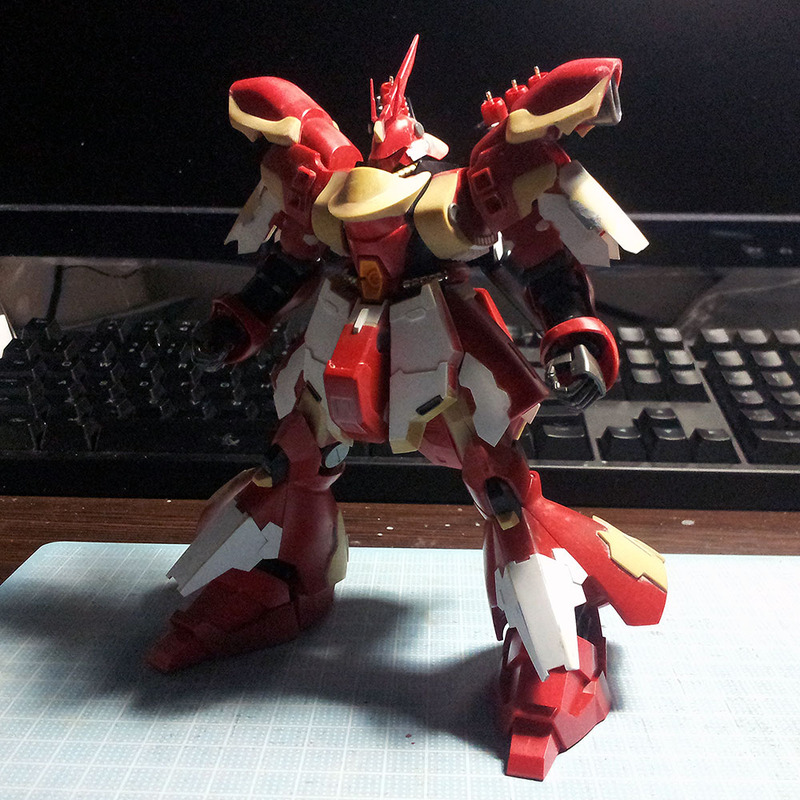 This was a really slipshod job as I didn’t make any plans to implement the joints properly beforehand. 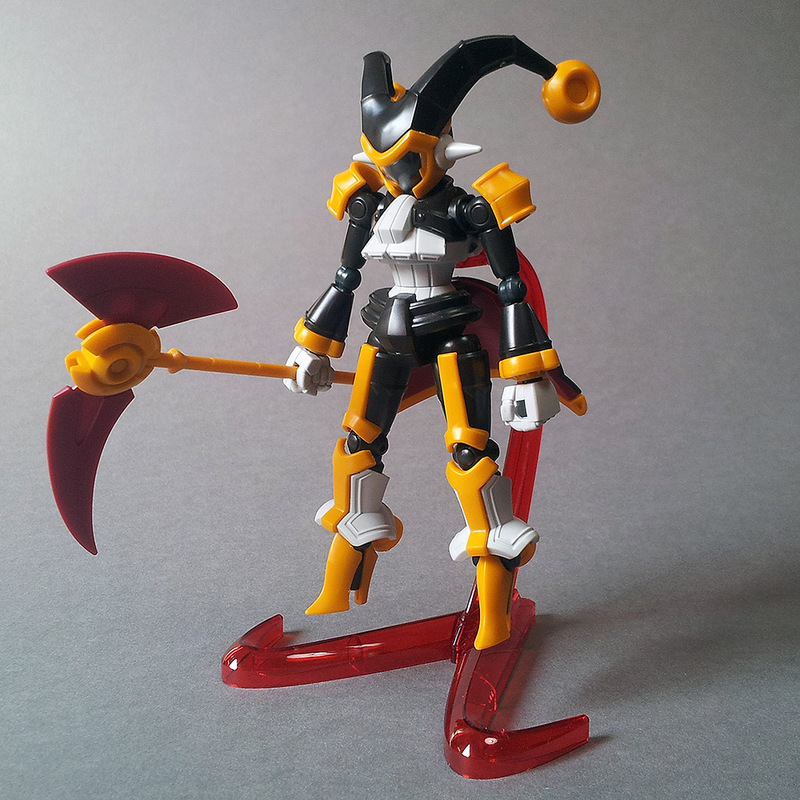 The double joints peg into the hips and are halfway inside the existing thigh cups revealing the ball shapes at the hips. They look a bit odd but the trade-off is that they offer a much wider range of motion now. 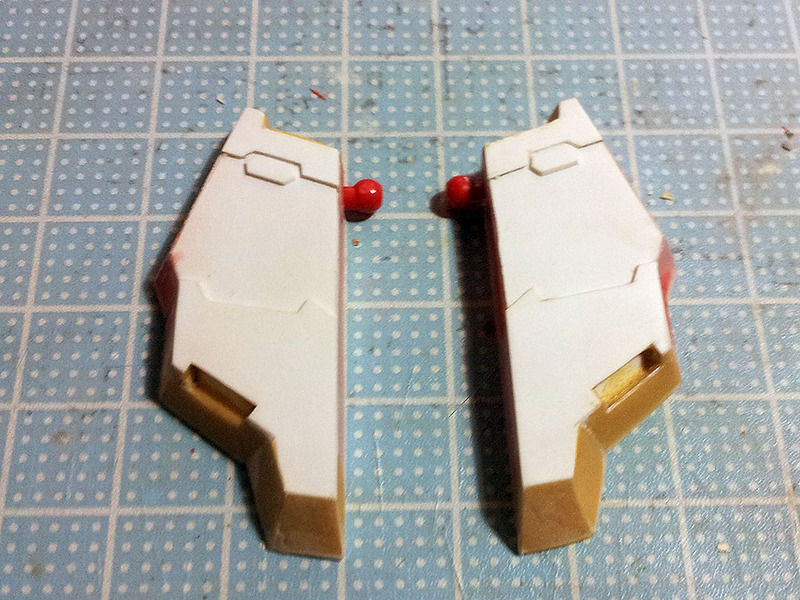 I also trimmed a little bit of material from the insides of the knees so that the legs can now straighten completely. 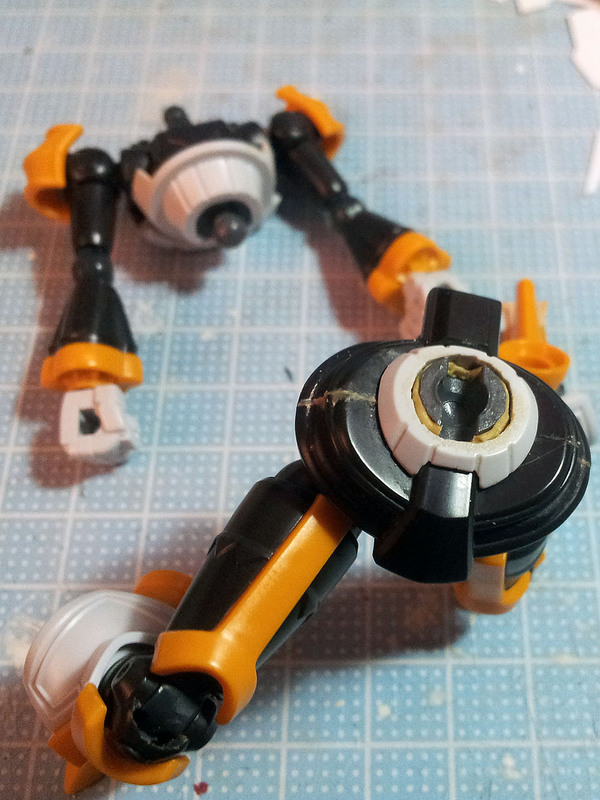 I also decided to increase the range of motion for the waist joint by replacing the existing peg with a ball joint. This was done clumsily though – I gouged out material from the white lower waist piece and widened the existing hole recklessly so now it looks unsightly. I can patch up the mess completely if I leave the white bit permanently attached to the hips but it might be troublesome to paint later on. The peg in the torso has been replaced with a ball. As you can see in the picture it’s now possible to make the Joker assume a kneeling position. I was really busy the past weekend and didn’t manage to upload a post on time. 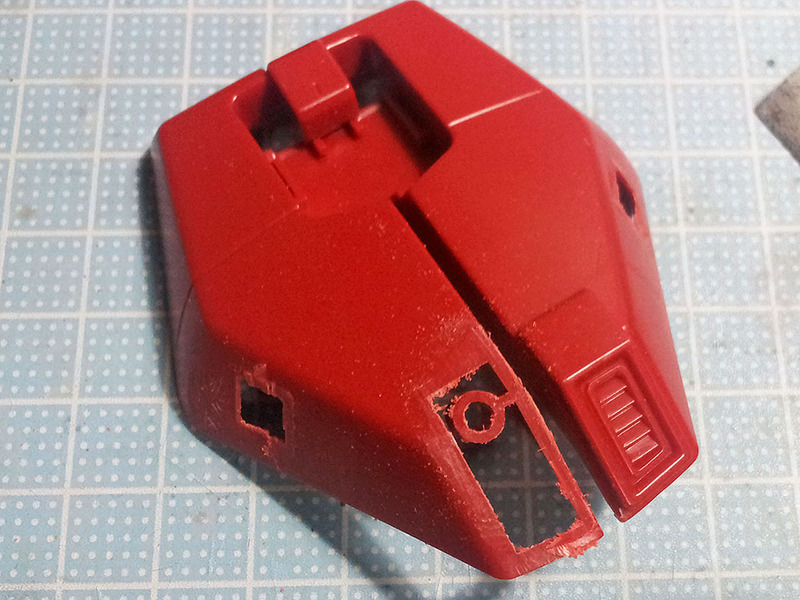 I got stuck in a rut while working on the Sazabi and decided to start on something else while thinking about it. Despite the amount of work required to get these little things to look decent I still went ahead and got the Joker as I liked its design. Here’s a quick snapfit of the thing. It’s from the first season of the anime and it has some issues, most of which are characteristic of the Strider Frame, the in-game name for this type of fast-hitting, lightly armoured character. 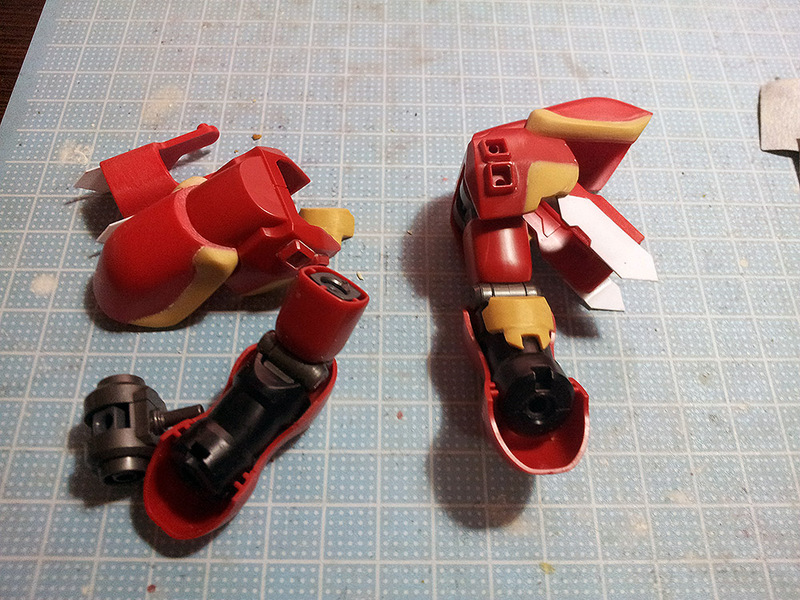 The joints, especially those on the legs, are really loose. 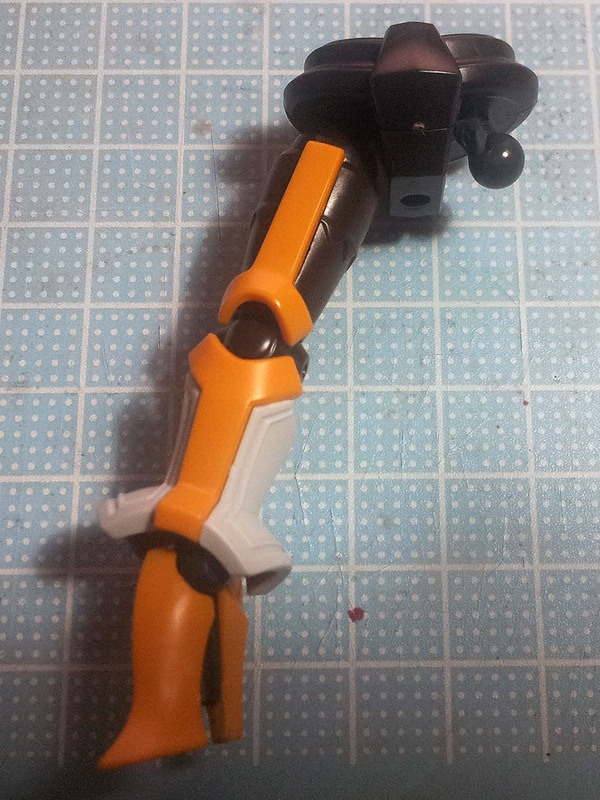 The legs themselves are prone to falling off the hip joints, which are also strangely designed, making it impossible to bring the legs together, or even spread them apart. I decided to rework the hip joints and improve the existing waist joint, but it took a bit of time before I could get everything fixed up and working, which I’ll post for the next WIP update. Progress on this guy has been mind-numbingly slow. I managed to find more square and rectangular bits and pieces which I promptly stuck all over the rear skirt. Fellow blogging comrade heathorn mentioned that some part of the rear skirt looks awkward so I might fix it once I find out where’s the problem. For the crotch area I made a hole on both sides so I can stick some round bits in there. The front has been adjusted but I’ll need to fix the gap showing. For the side skirts I couldn’t think of a good way to bulk them up using pla-plate so I only stuck some small pieces on the ends. In the meantime I’ll start working on the legs. 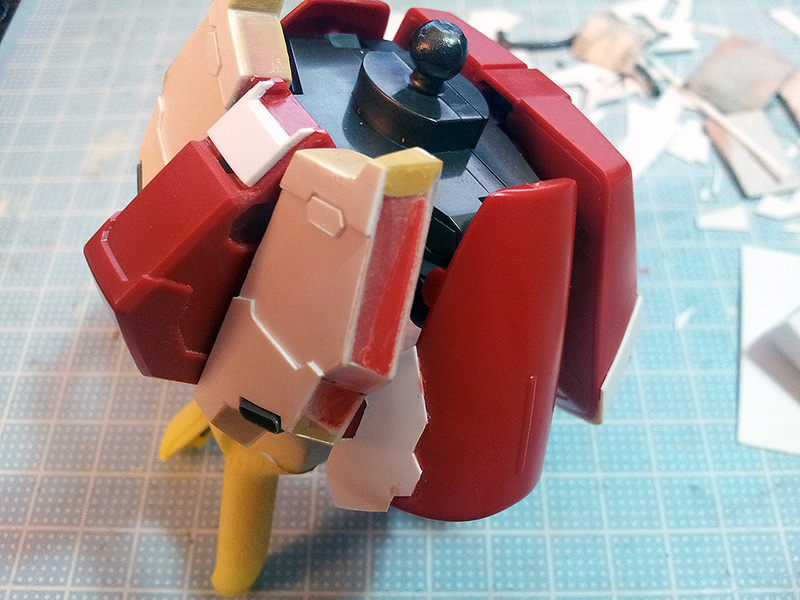 I’m not too keen on slapping more epoxy putty so it’s a simple affair for the head. 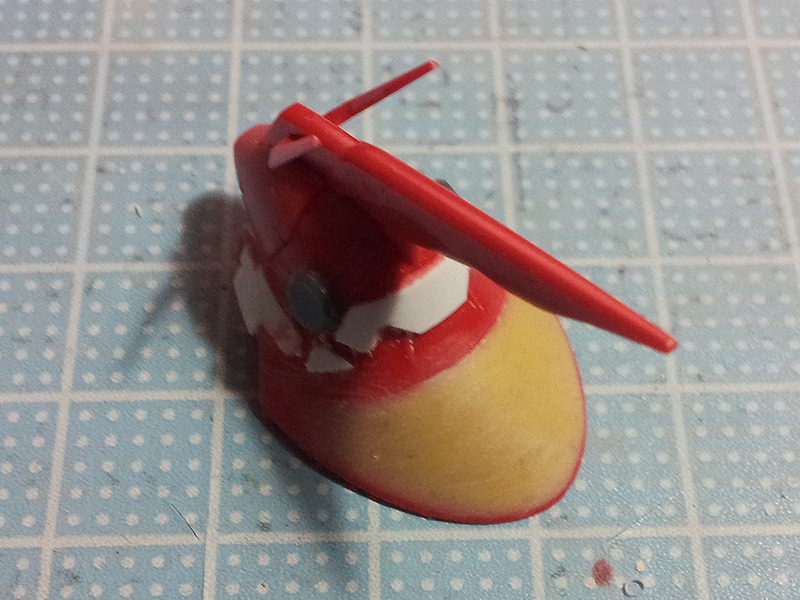 Sanded the round pieces a bit thinner and stuck some randomly cut bits of pla-plate around the helmet. In retrospect I should have stuck the round piece on my sheet styrene before cutting them into shape so that the round piece looks better integrated with the rest of the mess. Some time later I had second thoughts and decided to just go ahead and slap on the epoxy. I didn’t really like how the back of the head was concave-shaped so I made it into a convex shape instead. Onto the waist. I wanted to extend the length of the front skirt pieces but due to my horrible pla-plate skills they are now kinda encased inside large swathes of plastic. 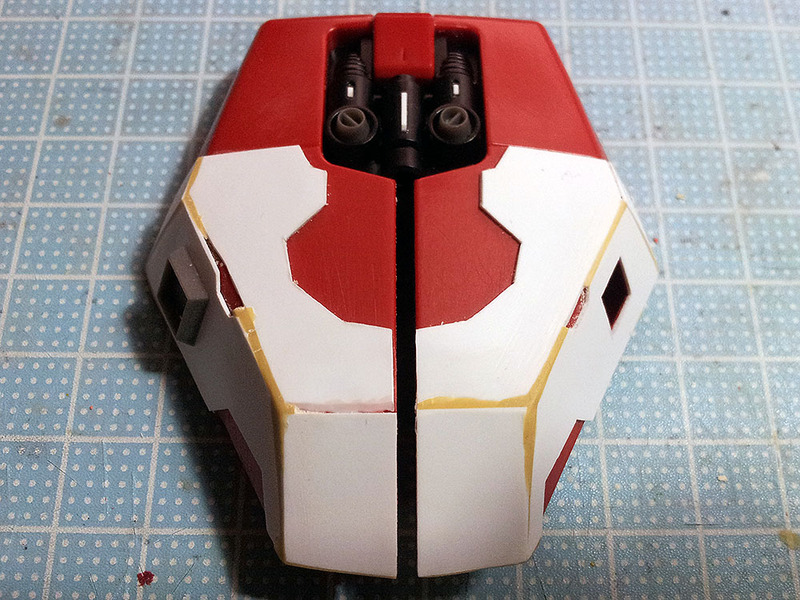 On the back I used some sheet styrene to hide the mess. 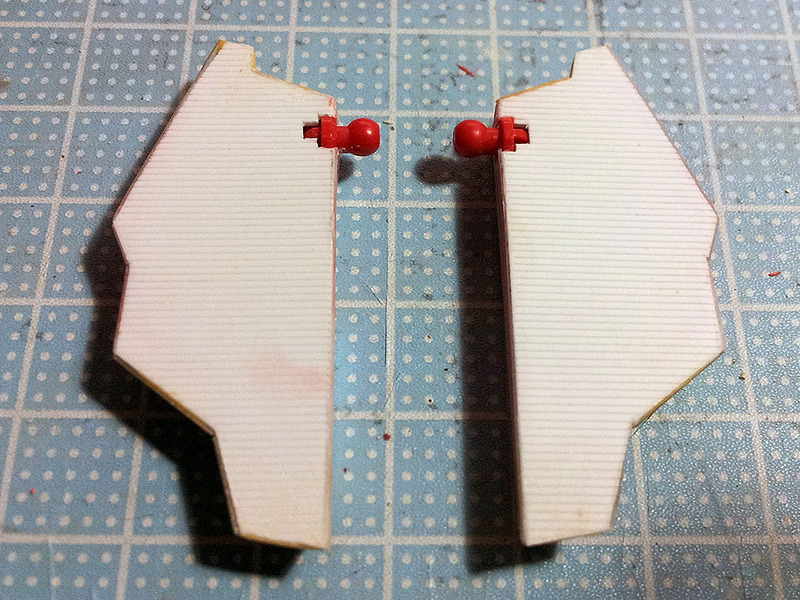 I made templates for these so that I can cut out one of pair which I will use to add detail to the back. The plan was to replace the existing blocky vent things on the back skirt. They were all removed using an etching saw. I ended up slapping on more plastic but due to my horrible skills there’s a lot of work needed to get rid of the gaps on all the edges. For the past month I’ve been doing everything except touch the Saz. I think the mess it’s in right now is killing my motivation further. I started my new job a week ago but so far it’s fairly easygoing for me – nothing but learning Japanese, and most of the material has been a repeat of what I’ve learned this year elsewhere. We haven’t been assigned anything else to do and have been going home after our 3-hour classes, so my afternoons are mostly spent either in Second Life or napping. Anyway, I can’t evade the main issue so after a long time languishing in my drafts folder since my previous WIP post I’ve finally gathered enough material to cook up a new update. Since my last update I did a little more work on the shoulders. 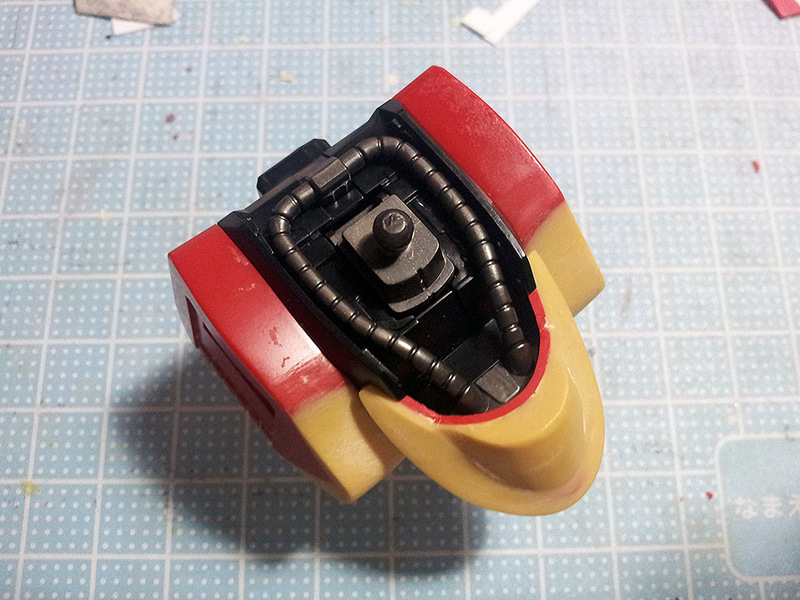 Adjusted the edges of my epoxy mess on the pauldrons, and stuck some Kotobukiya thruster cones to fill up the empty hole. 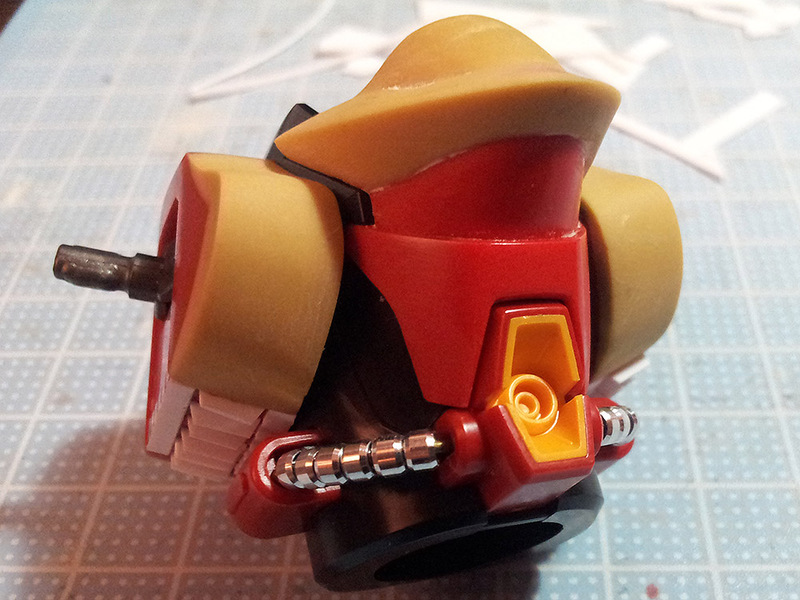 They’re currently mounted on ball-shaped joints but I’m not sure if they look a little plain. I’m finally getting close to what I wanted them to look like but I’m still lazy to add in the details. I’ll leave them as they are for now and start on the rest of the body. It kinda kills progress if I keep on working and getting stuck on the same body part. In the meantime I started to work on the torso, and went on several more resupply trips, of which I stopped taking photos of altogether later on. 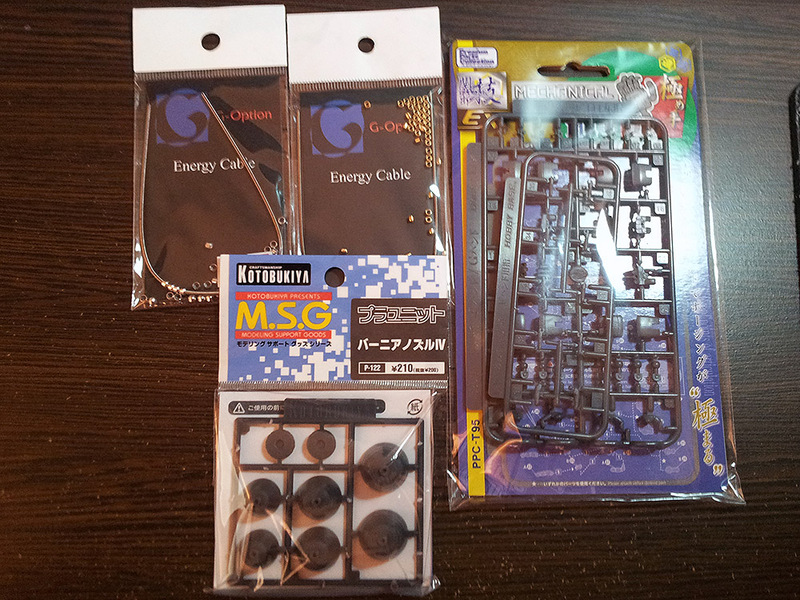 Right now there’s a fairly large pile of Kotobukiya and other aftermarket plastic bits and pieces all over my table. 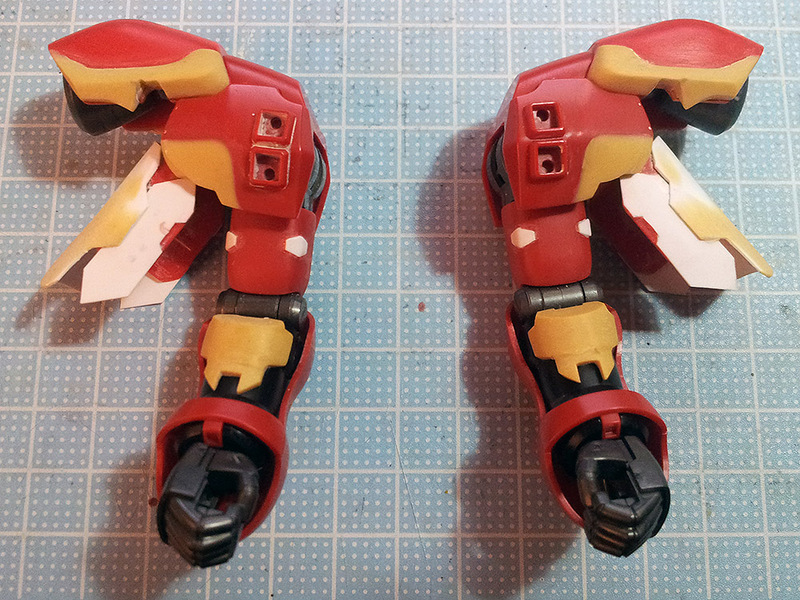 Realised the Sazabi’s hands are slightly larger so I might save these hands for another project in future. Since I’m at it I might as well go all out and replace the power cables on the collar and waist. I finally managed to find some square-shaped plastic bits on another supply run so I can at least replace some of the existing square details if I need to. The cable on the collar was fairly easily done using a single length of brass wire and threading the metal parts and plastic remains onto it. Not so for the waist though – while I started with a single length of wire as well the springs were four separate sections and they kinda run all over the place. I’ll have to think of a way to get at least the springs to stay in their positions. I’m wondering whether I should make the torso longer. It’s a lot of work and I’m really lacking motivation when it comes to this sort of stuff though. By the way, armpit heat sinks heh. So, to the backburner and onto the head. I think I might have had enough of all the epoxy putty work heh. Plus I still haven’t put my plastic bits to good use yet. Commencing my messing around with this kit with a resupply run. 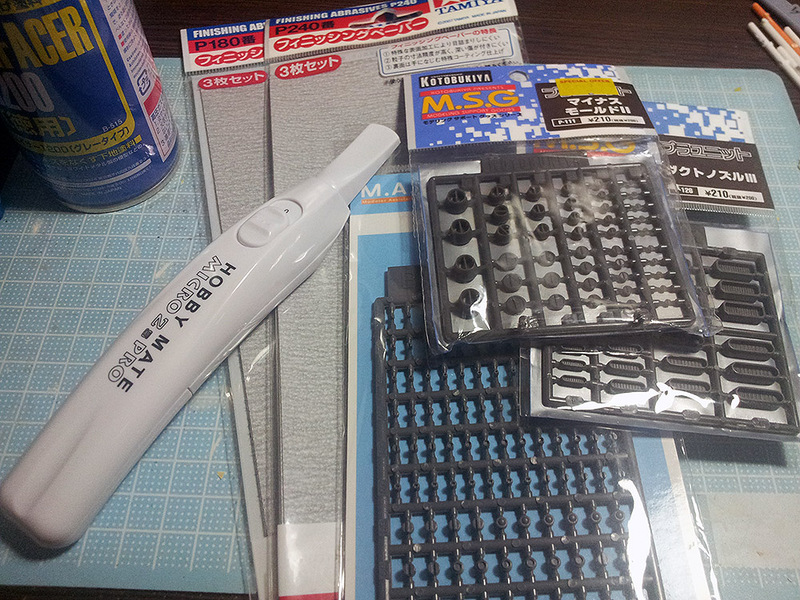 Bought an electric toothbrush sanding thingy so I wouldn’t have hand cramps from all the sanding. I went to a certain shop and bought the most coarse sandpaper they had only to find an even coarser one in another shop. The rest are random plastic bits to add on to my little collection of plastic bits and bobs. Lastly the primer spray can is for convenience. 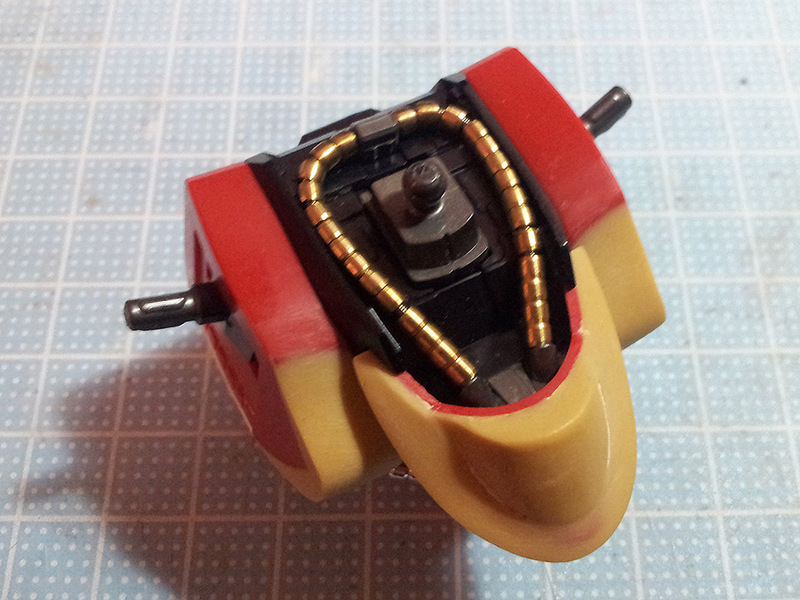 I’m still short of some square-shaped bits and I’m thinking whether to replace the cables around the Sazabi’s waist and neck. I got a box of Tamiya epoxy putty which I commenced using for this kit – hopefully I can make good use of it before it goes bad and hardens. Only one pic to show my slow progress. Started with the arms as I felt those were the hardest and adjusted the shape of the shoulders, cutting off some existing material and adding on a bit. Also sculpted a piece of armour for the forearms. I think the hardest part about all this modding is having to craft identical shapes by hand. Right now it’s tough to shape consistent curves on my parts. That is a skill I sorely lack even when it comes to cutting straight lines and identical looking parts on sheet styrene. Anyway, I’m far from finished with the arms. The shoulders still need work especially on the undersides, I need to scribe some lines, and more sheet styrene to stick. Other than my little vacation I haven’t been putting a lot of time into this kit every day as I would have preferred to. Mostly being distracted all day doing other stuff like playing in Second Life heh. My avatar is over 6 years old, and my addiction to it has been occurring in phases, with the current one being one of my longer ones. I have no idea if anyone in my country know of this as I have never met a fellow countryman. If you want to hang out with me, just post your avatar name and let me know. 😀 Maybe you’ll be surprised when you see my avi.